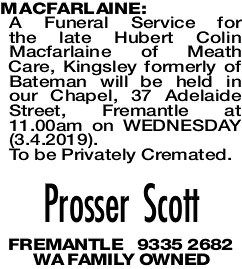 A Funeral Service for the late Hubert Colin Macfarlaine of Meath Care, Kingsley formerly of Bateman will be held in our Chapel, 37 Adelaide Street, Fremantle at 11.00am on WEDNESDAY (3.4.2019). Dad, the last 20 minutes with you meant the world to me! I shall cherish all the good memories we shared as a family of four, now one. 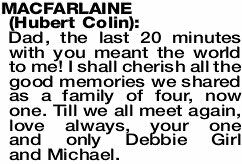 Till we all meet again, love always, your one and only Debbie Girl and Michael. 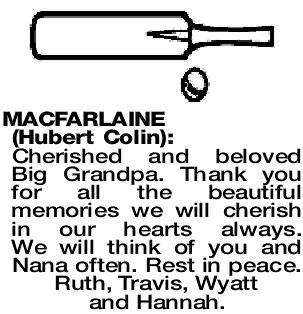 Cherished and beloved Big Grandpa. Thank you for all the beautiful memories we will cherish in our hearts always. 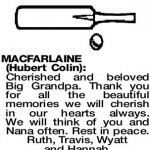 We will think of you and Nana often. Rest in peace. Ruth, Travis, Wyatt and Hannah.